John Hubbard's 1954 CJ-3B has a Beachwood Canvas 4-piece halftop enclosure. Each Beachwood Canvas top is individually made and fitted to a set of original bows in the shop, and John has nothing but good words for his top. In fact he says that it (unlike most of us) "improves with age." Some early tops had small automotive glass windows instead of vinyl. This was to allow the canvas to fold into small packages for stowage on top of the rear wheel wells. By late CJ-3A production, larger vinyl rear side and rear windows were used. 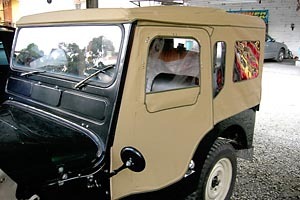 John decided to use the early-style glass rear window on his 3B halfcab. Bill Norris' 1947 CJ-2A has a reproduction top made by New Life Resources canvas shop in Vermont. Bill commments, "Altogether there are 10 pieces. The 10th piece is the rear flap for the halfcab. It is correct for a late style 2A top. That is, it has the lower door hinges that mount next to the tub and not on top of it. It also has the latches on the rod behind the door and not on the door itself like the early 2A's, and the original black metal frames that go around the plastic windows. These were only used on the 2A's and very early 3A's. You can also see the zippered flap on the driver's side for hand signals. Always get a kick out of seeing people's expression when my hand comes through the door. They have the pattern for 3B's now." See also a front view photo (120K JPEG). Todd Kerzic has had a seven-piece top made for his CJ-3A by New Life Resources, now owned by New Life Canvas in Minnesota.. It can be installed as a full top (90K JPEG) or a half top (80K JPEG). In my opinion it looks really good, with the attention to detail one might expect from Beachwood, but at about half the price. Andy Gil found a shop in Colombia that can make quality custom tops at a reasonable price, in all the different 4 to 7-piece configurations. See Canvas Tops Made in Colombia for more details. The cost of a reproduction canvas top is enough to get your attention. It has motivated some CJ owners who like the appearance of the original canvas top, to look to their own resources for shelter. Roger Bensgard of Sweden states that the Beachwood Canvas top is much too costly with the shipping and the twenty-five percent import duty. He has made his own set of bows and rods and has found a tattered but original soft top to use as a pattern for making a reproduction top for his CJ-2A. Krister Olsson's CJ-3B with minimal full top (120K JPEG) is seen in The Jeep in Sweden . There is no removable rear panel on this model. Although not made by Beachwood Canvas, it is constructed like the "1 Piece Trailrun Full Top," and shows us we can have a nice-looking but fairly inexpensive canvas top. A sophisticated soft top was made for Jon Rogers by a retired military jeep top maker in Australia. The arched rear opening suggests the original, and the roll-up rear side windows are just as cool as they can get. Gary Keating bought his 3A with the bows and this top already on it. Gary explains it as a top most likely made by the local canvas shop. It functions like the Surrey top but without the decoration. Mahlon Gridley of upstate New York bought his 2A with the skeleton included. He bought a large tarpaulin from a farm supply store and fabricated his own top for his CJ-2A. It looks similar to the experimental top at the beginning of this article, without rear side windows but with steel framed doors. Mahlon says he spent as much time measuring and re-measuring as cutting and sewing. It appears to have been time well spent. Weebee Webbing, a manufacturer of canvas military tops and equipment made this top based on the civilian bow system. Not a reproduction, but an interesting solution. While the original bow and rod skeletons for the civilian Jeep are rare, they are worth searching out. I bought a complete set, including door frames, for $50 plus shipping. The same set from Beachwood would have cost about $800 (if I am reading their price list properly). Actually an extra set of bows was thrown in, so I have a complete full top bow and rod set and an extra set of half top bows. Not bad, eh? This article was based on my own interest in having a reproduction canvas top for my '53 CJ-3B, and my belief that there must be a less expensive alternative to a commercially-made skeleton and canvas top. I am halfway there, but there is still a long way to go. As usual a lot of help came from 3B Page watchers who spent time and effort sending information and photographs of their own CJ's and their canvas top solutions. Also on CJ3B.info, see Putting on a Soft Top and a history of Early Civilian Jeep Hardtops. Go to CJ-3B Specs and Tech Tips. 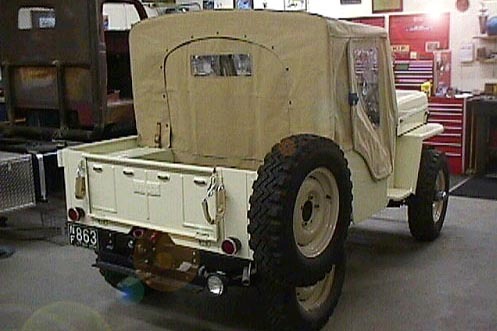 See more Universal Jeep History on CJ3B.info.